However...being that our temps were in the 20's this week (burrrr), I felt the need for something a bit heartier and satisfying (great side...aside). The only stipulation is it needed to be quick and easy....and include the baby broccoli! The days are ticking by and the "to-do" list is growing exponentially with each passing minute. Dinners, of late, have all been in the 20- to 40-minute range (from thought to finish). This little pasta is a throw-together recipe I came up with awhile back, and one we always enjoy. 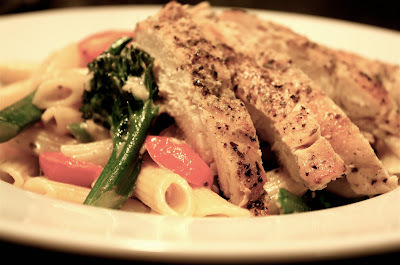 You can keep it vegetarian or serve it up with strips of sauteéd chicken breasts, as I did. 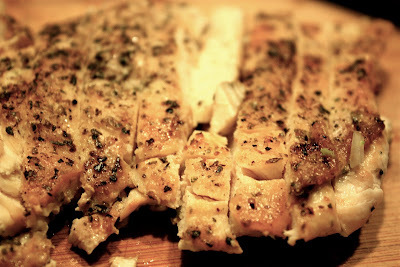 The combination is good and the chicken (what I call my "no-brainer" chicken...think everyone has their own little "go-to," quick-prep variety of chicken) is super easy and tasty. The benefit of having the accompanying chicken is you'll use the same pan to get your pasta goodies going and, thus, get to use the leftover chicken flavorings in the pan (yum). I used boneless, skinless, chicken breasts (organic) that I just lightly pounded (between plastic wrap)...not so much to thin them out as to just get them more uniform with regard to thickness. This way they cook up very evenly. I season them generously with salt, black pepper, and dry Italian seasoning, and then just sauté them in olive oil (I used about three tablespoons oil for two large breasts). Once you drop them in the pan, just let them do their thing...turning only once to flip them over. 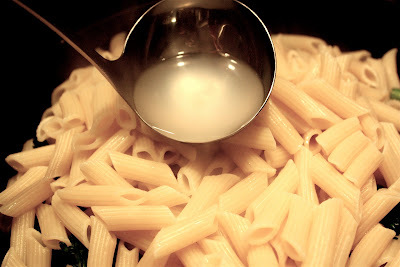 Once you get your chicken started, put your pasta water on to boil ("season" it with a good toss of salt). I used just slightly less then a full 16-ounce box of penne rigate. Once your chicken breasts are done, remove them to a cutting board and loosely cover them with foil to keep them warm...and get started on your pasta fixings. 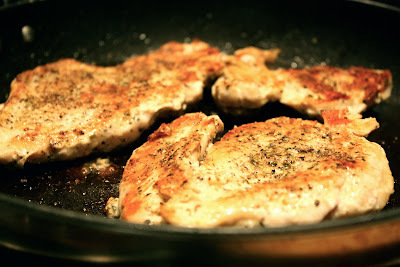 In the same skillet you used for your chicken, add another tablespoon of olive oil and scrape the pan a bit to loosen all the yummy chicken bits left behind. Add some chopped onion (I used about 1/4 cup) and some chopped garlic (about three or four large cloves) to your pan. Sauté onions and garlic until the onion just begins to brown up a tad. Add in your long cuts of fresh baby broccoli and sauté until just tender...but still crunchy (maybe three to five minutes). Season your veggies lightly with salt and pepper (you'll be adding pasta water later, so don't get carried away with adding too much salt!). Once the broccoli is done, your pasta should also be ready (about nine to 11 minutes for al dente). If not, just turn off your burner (if gas) or remove your pan of broccoli from the burner for a bit until your pasta is done. Once you're back in business, using a slotted spoon/ladle, transfer cooked pasta directly to your pan of broccoli (don't drain it and lose all your pasta water!). Add a few ladles of pasta water to your pasta/broccoli mix (it's good and starchy...perfect to help get your sauce going). Stir your pasta and broccoli together, then add in a full, eight-ounce container of crumbled feta cheese (I used one that was punched up with some roasted garlic and herb seasonings...add more if you'd like). Mix feta into your pasta/broccoli mix and let it dissolve into a loose sauce (adding a bit more pasta water, if needed). The "sauce" will be very light...adding flavor more than substance. Toss in some good, shredded parmesan cheese (maybe 1/4 cup) and some halved grape tomatoes (I used about a cup of halved Sugar Plum Grapes Tomatoes). Mix everything together and season with salt and pepper, to taste. (In the amount indicated here, this "recipe" should give you four hearty servings of pasta). Plate your pasta and top with some chicken and a sprinkle of shredded parmesan cheese. This is a great, quick, satisfying meal. Yet...with the light, flavorful feta-based "sauce," fresh baby broccoli, and ripe little tomatoes...it's a hearty and healthy pasta! 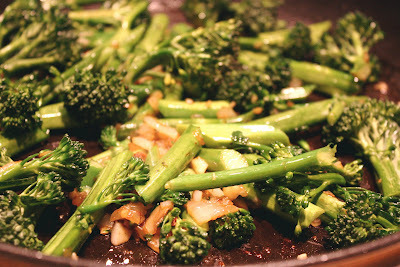 Note: Regular broccoli will certainly work in this dish as well. 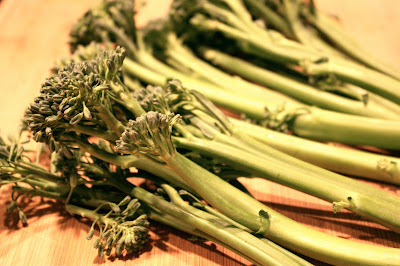 I just prefer baby broccoli, with its tender florets and long, crunchy stalks.